This past week we rocked Hacker Camp 5 and Shenzhen Maker Faire. It was a huge party, as always, thank you to everyone who came! Instead of covering the camp and fair directly, we saved the images and chat transcript from the shenzhen_hacker_bei group on WeChat. Nearly 100 hackers, makers, and organizers shared a week long discussion. Hopefully this is a very different perspective than you’ll get from anywhere else. We’ll clean it up and post it in the forum and blog over the coming week. China is embracing hacking, making, to an insane extent. Local, provincial, and national governments are all funding hackerspaces and promoting innovation. The Shenzhen Maker Faire is probably the most impressive Maker Faire I’ve ever been to in terms of infrastructure and presentation. Open source seems to be on fire in China. 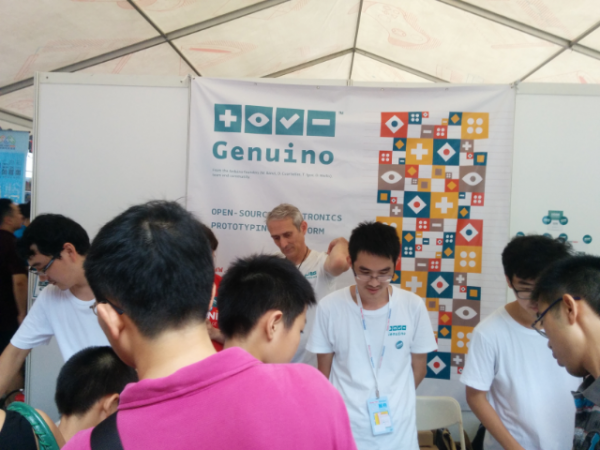 At the first Shenzhen Maker Fair I explained open source to skeptical locals. This year almost every major product on display was open hardware (or claimed to be…). This entry was posted on Monday, June 22nd, 2015 at 11:17 am	and is filed under Hacker Camp Shenzhen, Maker Faire. You can follow any responses to this entry through the RSS 2.0 feed. You can skip to the end and leave a response. Pinging is currently not allowed. HC 5 was just incredible. Thanks again Ian & Jin for the amazing experience. No more camps is very unfortunate! I was very much hoping to attend the next camp this fall. Has anyone stepped up to take over? Shenzhen seems daunting for the uninitiated.